I have been busy with unmothy things lately and so am rather behind. Apologies for the longish gap. I can't help breaking my silence now because that glorious highlight of this time of the year has come calling: the wonderful-looking, wonderfully-named Merveille du Jour. Not just one, either. TWO! A pair. And if only we still had some pears left on our espaliered fruit trees, I could have posed the lovely little things on one of those and made a small linguistic joke. But perhaps a rosy apple is lovelier. This is not a rare moth and thus it serves as an ace example of the wonders which surround us if we only look. Admittedly, you will be lucky indeed to chance across an MduJ if you do not have a light trap. But now, at almost five in the afternoon, I could give you that chance. One of the two above is still snoozing on the apple tree. Its lichen camouflage is superbly well-suited. And as a poignant reminder of the transience of these creatures, which seldom live more than a few weeks, here's the sad but beautiful remains of a Red Admiral which shone out at me from the lawn this afternoon while I was weeding. How lovely to see your pictures! If you want to play with words, maybe your pair was a pere and a mere. It's nice that a papillon de nuit is called merveille du jour. And as "veille" means Eve, it's only right that you posed them on an apple. Thanks so much for the wordplay - excellent! 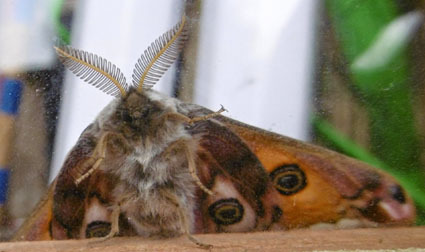 Telling most moths' gender required temporary freezing, magnification and in the worst cases, dissection, so for me it remains a pleasant unknown.